One of the great benefits of using art in therapy is that the creative process allows for a variety of sensory experiences. Sight, smell, touch, and sound are all elements associated with art-making. The materials that one chooses to use for their artistic creation has great meaning. The way a person interacts with the art materials they use can bring up emotional states triggered by the sensory experience. For example, the act of molding clay can be overwhelming for some who may not be comfortable with moist or fluid-like materials. This person may prefer to use a more structured material such as colored pencil. For another person, colored pencil may seem restricting in comparison to clay, as clay is easily molded and colored pencil tends to be somewhat rigid. 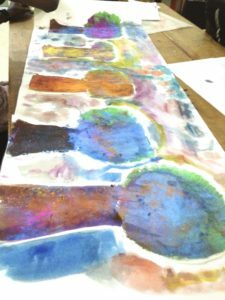 Art materials can be fun to explore as you widen your array of experiences through experimentation with supplies. Fortunately for the children at the Touch A Life Care Center, they have access to a wide variety of art materials in the Connor Creative Art Center. The children are encouraged to explore all different materials that fit their unique interests as well as tap into the full range of their emotions. 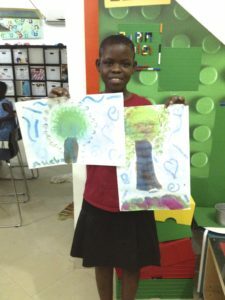 While living in Ghana and working at the Touch A Life Care Center, I enjoyed opening the art center on evenings and weekends so that the children could come there and enjoy their free time. One Friday night toward the beginning of my stay, one of the girls asked if I would open the art center. I happily agreed. We opened the closet and grabbed the first material we saw: brightly colored powdered tempera paint. This is a material that I am quite unfamiliar with, and I welcomed the opportunity to try it out. We came up with the idea to paint trees with watercolor paints and sprinkle the powder on top for decoration. We listed to The Beatles while we painted to liven up the atmosphere. Slowly, the girls began to trickle into the art center to see what we were up to. The girls and I had a blast painting trees and covering them with the powdered paint. Not only were our hands and faces covered in powder but so was the art center, too! Getting messy was fun and we all shared laughs as we painted. When we had each finished painting our individual trees, the girls and I cut them out together and pasted them onto large mural paper to form a compilation of all of our art. At the end, we all chipped in to clean the art center together. As a new art therapist in an unfamiliar place, I finally started to feel at home. This activity created a bond between myself and the girls that had not existed before. Through this experience, I was exploring an unfamiliar art material (powered paint), as well as a new environment. Together, the girls and I formed a connection that was facilitated by art. The activity also seemed to boost confidence in some of the children who were not completely comfortable with their drawing abilities. Working with a material that has little structure, such as paint, can be a fun way to explore ones’ creative side without the added pressure of creating a realistic image. The mural was displayed in the art center for the remainder of my trip. The children loved to look at each piece, guessing who painted which tree! A great story, thanks for sharing!